My friend and I recently went out to dinner. The most important thing with this perfectly normal scenario is that we went out to eat at a local pizza place. Wait, no, that's not the most important bit. What's more important than where we went for dinner (which really says something) is the car that we came up behind at a stoplight when we were heading back to his apartment: a Mercedes-Benz GL63 AMG, one of the most pointless cars ever. You see, the problem with the GL63 AMG is the badge. AMG. That's the same one that was used on the SLS supercar, as well as many high-performance Mercedes-Benz models held in a high regard with the enthusiast community, such as the BMW M3-fighting C63 sedan or the BMW M5-fighting E63 sedan. All three of those are fast cars. Very fast cars. Which I believe is something that a car needs to be in order to deserve a badge like 'AMG'. That's where the biggest issue with the GL63 lies — speed. Mercedes-Benz won't actually tell you flat out on their website how fast it is, so you have to dig deep into the spec sheets and Wikipedia to find out. That's just what I did, and the results were, well, interesting. The Mercedes GL63 AMG SUV will do 0-60mph in 4.8 seconds, or at approximately the same rate as one of those luggage conveyer belts at the airport. 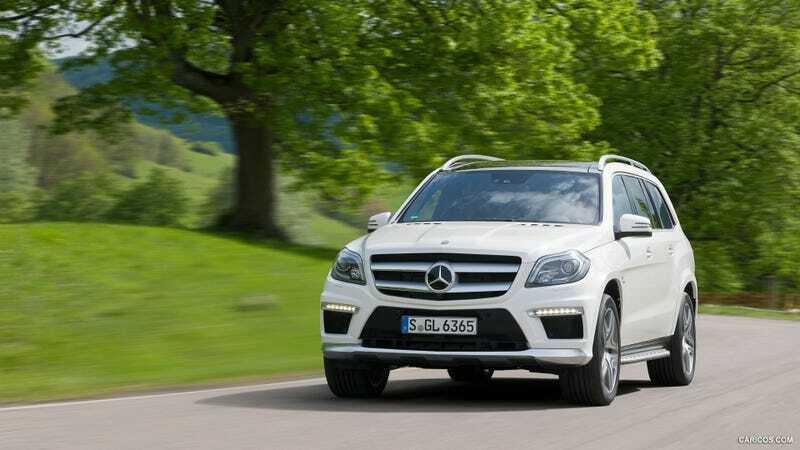 I might be exaggerating just a tad there, but I did find out in my admittedly small amount of research that the GL63 AMG actually accelerates slower than AMG's other SUV model, the Mercedes-Benz ML63. Which is a problem. The ML63 is smaller and lighter than the GL63, so you'd expect it to be quicker, right? But the GL63 is more powerful. A lot more powerful. And it's more practical and more luxurious than the ML63 AMG. In my opinion, that's why the Mercedes-Benz GL63 AMG an utterly pointless car: it's just too big and too slow to be worthy of its highly prestigious badge, yet Mercedes has stuck thousands of copies of the thing onto its exterior and tucked them away in its interior, as well. Yet, despite all of its flaws, missed hits, and shortcomings, I still have some respect for this big, bulky, slightly sluggish SUV. Why is that, you may ask? It's because the GL63 AMG is a unicorn. It's rare, and when you do see one on the street, it's exciting, because you know that someone out there has spent their hard-earned cash on a car the size of my friend's apartment that isn't quite sure what it wants to be, a street racer or a luxury living room on wheels. At least, that was my reaction to seeing that one GL63 AMG on the road (which is even less common in my area; the last time I checked, there were only 12 examples listed within 25 miles of my ZIP code on Cars.com). My friend's reaction was quite different, as it began and ended with several things that I'm not going to include in this article. If it was my money that was going to be spent, though, I'd probably take it elsewhere.